The countryside around Belgaum is wonderfully green even in hot summer of May…. 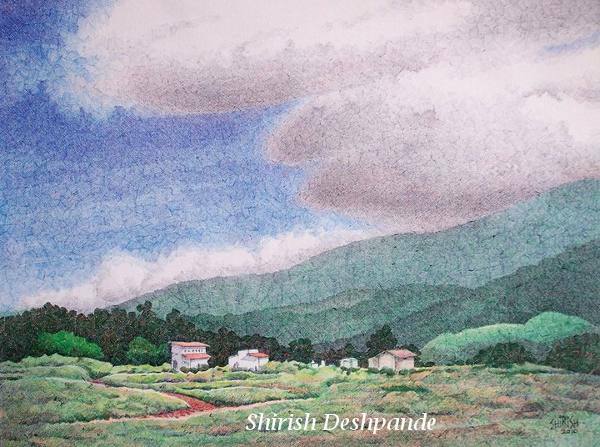 here is a landscape finished today in celebration of the beauty of Belgaum……:-) Look at those dramatic clouds in the sky….. It is done ballpoint pens on canvas. AAB is proud to have covered this wonderful artist long back. Shirish… vry gud work. we are desirous to see your other paintings too. The different hues and shades make the painting so live and real. It is paintings like this that transform us into art lovers. Keep up the good work, Shirish. beautiful painting.the painting is superb taking people of my generation, who have eventually moved away from belgaum, to the college days of fifties. thanx keep showing us. excellent land scape. Simply Beautiful! This reminds me of Belgaum 25 years ago. Thanks for sharing it with us.